Legend II cleaner provides pressure-side power without the added energy consumption of a booster pump. That means fast, through cleaning and a lower cost to operate. 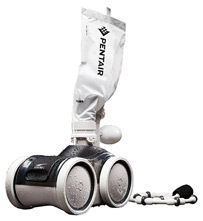 Dual-jetted design powers water through unit to create powerful vacuum action. Learn more about the Legend II cleaner and if this model is the best fit for your pool with our Selection Tool.